As mentioned on our FB page, the final event in this years series in Hollywood will NOT be part of the series as far as points are concerned - Don and Ruth plan to run it as a Score event to facilitate the BBQ, prizegiving, and a general good time. This means that the best three out of four events will count for points. Long course (men) - Angus Tyner leads over Cyrill Baumann, with Wesley Brownlow close behind, but dark horses Colm Moran and Colm Hill, and several other M21s) lie in wait with only two events completed - so theres a good chance for them to gain a spot with a good run in Newbridge. Long course (women): Heather Wood currently leads over Ger Power and Eileen Young - but Eileen has only completed two events, so if she comes to Newbridge, Heather will need a good run to hold onto that top spot. Medium (men): Tony Maher still leads over Per-Olov Elovsson and Tommy Burke, with Ian Murphy just behind - all four runners are close, so there's still a chance for a shake up in those placings, depending on how the last event goes. Medium (women): Catherine Joyce currently holds the lead, as the only lady to complete four so far, but just behind her are Debbie Whelan, Deirdre Coyle, Mary O'Connell and Kathryn Walley - all with just two completed so far, and all within 200 points of each other - so everything to play for here too! 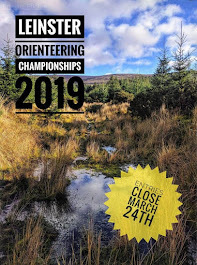 Adventure (men): Conor O'Brien leads, with Tom Malone and Donnacha Malone behind - but Conor Masterson, Daragh Young and Paul Butterfield are close with only two completed so far - they could all claim the top spot depending on their last runs. Adventure (women): Gabrielle King has a good (unassailable?) lead over Aoife Masterson and Beth Joyce - though Yvonne Reidy, Niamh Browne, Anyta Richardson and Louise Fitzgerald are all in touching distance, given that they have only completed two so far. All in all, there are still multiple places up for grabs in Newbridge - prizegiving will take place the following week (19th) in Hollywood, at the usual Score event & BBQ to mark the end of the Series.